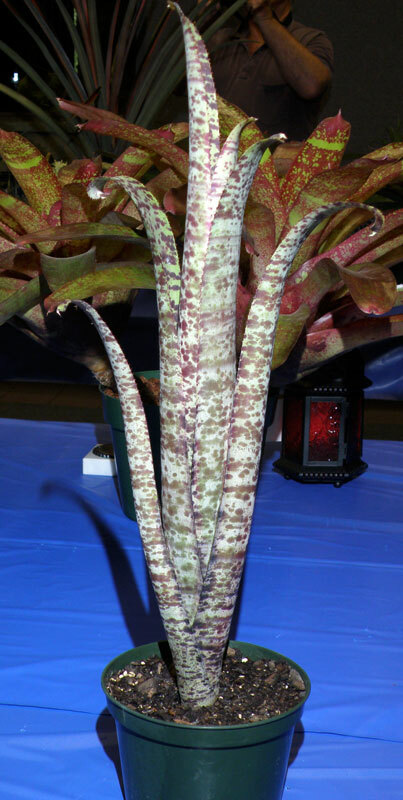 Congratulations to the following winners of the 2015 Bromeliad Society/Houston show held at Mercer Arboretum on May 15-17. Mulford Foster Best in Show Horticulture, Steve Reynolds, Racinaea crispa. 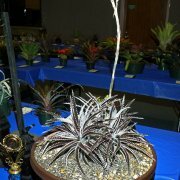 Morris Henry Hobbs Best in Show Artistic, Allyn Pearlman, with the artistic arrangement, “In the Middle” with Cryptanthus ‘Stephen Hoppin’. Best of Div. I, Pitcairnioideae, Dyckia ‘Michael Andreas’ (Brittle Star F2); entered by Cherie Lee. Best in Sec. 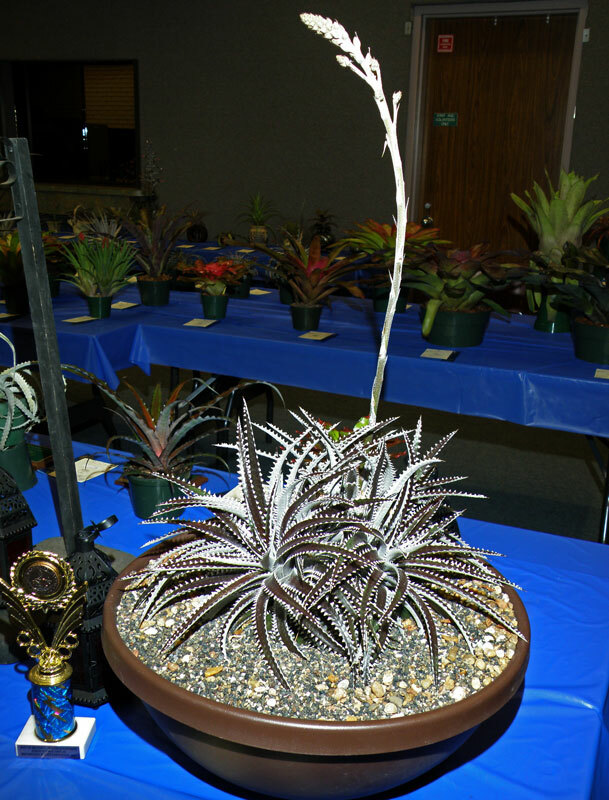 1A, Single Plant, Dyckia marnier-lapostollei X platyphylla, Gene Powers. Best in Sec. 1B, Multiple Plants, Dyckia ‘Brittle Star F2’, Cherie Lee. Best of Div. II, Tillandsioideae, Tillandsia fasciculata ‘Tropiflora’, Rick Richtmyer. Best in Sec. A, Single Plant, Till. streptophylla, John Schmidt. Best in Sec. B, Multiple Plants, Till. balbisiana, John Schmidt. Best of Div. 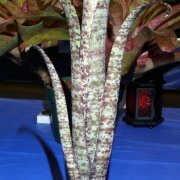 III, Bromelioideae, Aechmea phanerophlebia, Steve Reynolds. Best in Sec. 3A, Single Blooming, Neo. marmorata X ‘Avalon’, John Edmonson. Best in Sec. 3B, Single Foliage, Ae. orlandiana cv. ‘Medio Picta’, Rick Richtmyer. Best of Sec. 3C, Multiple Blooming, Araeococcus flagellifolius, Gene Powers. Best in Section D, Multiple Foliage, Bill. ‘Cold Fusion’, Cherie Lee. Best in Div. IV, Intergeneric Hybrid, Neophytum ‘Cosmic Blast’, Carole Richtmyer. Best in Sec. 4A, Neophytum ‘Galactic Warrior’, David Whipkey. Best in Div. V, Horticultural Displays, Till. fasciculate ‘Hondurensis’, Daryl Page. Best in Sec. 5A, Single Blooming, Till. dasyliriifolia, Daryl Page. Best in Sec. 5B, Single Foliage, Till. sprengeliana, Rick Richtmyer. Best in Sec. 5C, Multiple Blooming, Till. concolor, Rick Richtmyer. Best in Sec. 5D, Multiple Foliage, Neo. rosea, Steve Reynolds. Best in Div. VII, Artistic Arrangements, “Serpents”, Allyn Pearlman. Best in Sec. A, “Simple”, Allyn Pearlman. Best in Div. VIII, Decorative Containers, Cryptanthus ‘Thelma O’Reilly’, Joanne Woolsey. Best in Sec. A, Dyckcohnia ‘July’, Carole Richtmyer. SHOW STATISTICS – We had 29 exhibitors and 241 entries. The judges awarded the following ribbons: 129 AM, 84 blue, 26 red, and 1 yellow.